Rules and Regulations can be downloaded at the bottom of this page. Weigh-ins start at 1:00pm, The races will start as soon as possible. Ideally, each rank will start about 1 minute after its deadline, earlier if they're all checked in. Snacks, lunch foods, and drinks will be available as a fundraiser. This is a family event so bring the grandparents, uncles, cousins, and anyone else who might enjoy the race. 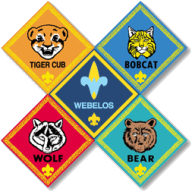 Please invite any of your scout's friends that you think might be interested in joining Pack 79 to see all the fun! 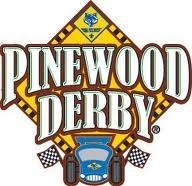 1) The Scout Derby - with the 5 fastest cars (1 Tiger, 1 Wolf, 1 Bear, 1 Webelos and 1 Arrow of Light) and 5 best in show cars from each rank all qualifying for the District Pinewood Derby. We return everyone's cars for them to bring to the district derby. Each winning scout needs to sign his own car in at the district derby. ALL 10 winning cars WILL BE SEQUESTERED AND HELD BY THE PACK until after the District Race. The 10 top cars WILL NOT BE IMMEDIATELY RETURNED TO THE SCOUT AFTER THE RACE on the 10th. 2)The Parent/Sibling/Alumni Derby - only siblings are eligible for trophies in this division. 3) The Girl Scouts Derby - The Girl Scouts will race their cars in their own division. There may be a couple opportunities to mold and shape the block of pinewood into a mean lean well-decorated racing machine. We will announce date(s) and time(s) for the workshop(s) if we get a parent or two lined up who has and can supervise the shop tools. The boys are not permitted to use power tools but they are encouraged to design the shape of their cars, sand them, and decorate them accordingly. Parents are encouraged to assist the child but they should let the child do most of the work. All entries in the derby will start with the "Official Grand Prix Pinewood Derby Kit" which includes the body, 4 axles, and 4 wheels. All nine pieces MUST be used before the car can race. The kits are sold at the local Scout Shop or online. All active Scouts received a kit at the November Pack Meeting. Parents and siblings may purchase a kit for $5.00. Cars may not exceed 5 ounces in weight and must conform to certain size restrictions and specifications. Decorating the cars are up to the imagination of the boys. The Washington Crossing Council 2015 Pinewood Derby Rules and Regulations are posted below. The cars must follow these rules or risk being disqualified.